On Thursday, August 31, 2017, the first day of the 8th annual New York City Unicycle Festival, unicyclist numbering 14 set out from the starting point location in the photo at the southern most point of the Manhattan Waterfront Greenway cycling path. The path begins just across the street from Battery park. The path follows along western coast of Manhattan along side the Hudson River. The group enjoyed a scenic ride north along the path to emerge on to the streets after passing through Riverside Park. They then traveled east through the street to enter Central Park where the group proceeded to ride south on the park drive making a lunch time rest stop at the Columbus Circle park exit area. After lunch the group continued south down Broadway to stop in the center of Time Square for a group photo. From there, the group traveled west through the midtown streets returning to the Waterfront Greenway Cyling path for the return trip back to Battery Park. Day two of the festival featured the customary annual afternoon traverse of the Brooklyn Bridge in celebration of Brooklyn Unicycle Day. A total of 48 individual unicyclists crossed over the bridge from the borough of Manhattan onto the borough of Brooklyn. From the foot of the bridge the entire group proceeded to make their way via the on street bicycle lanes over to Grand Army Plaza (pictured above). 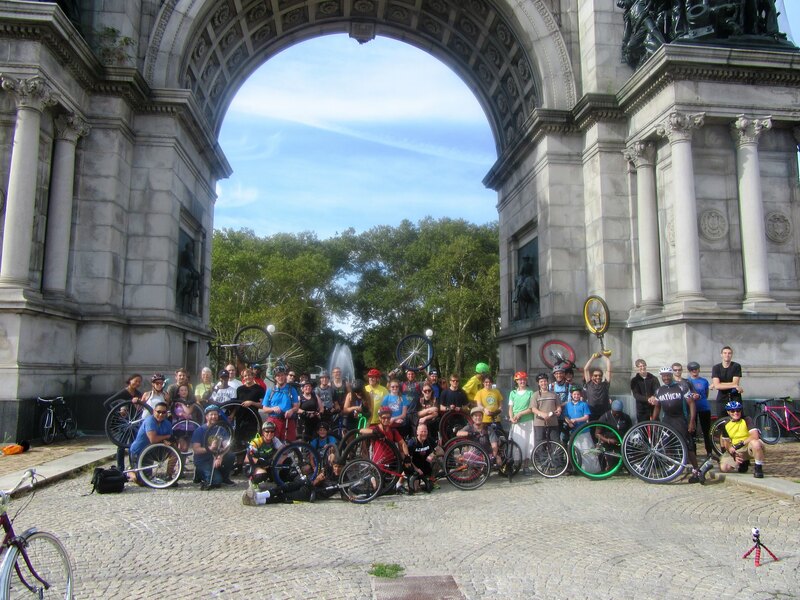 The entire group crossed the plaza to ride the length of Prospect Park and along the Ocean Parkway protected cycling path down to Coney Island. At Coney Island after fueling up at the Nathans Famous restaurant, the group assembled for a couple of group photos taken by Norman Blake. On day three of the festival, unicyclists and non unicyclists alike were treated to a plethora of unicycle festivities on Governors Island. The day one on Governors Island as always well attended. Throughout the day unicycle activities were in perpetual motion with background music provided by D.J. Sky King. If you check out the photographs you will get a sense some of the goings on. From unicycle basketball, to unicycle sumo wrestling, to people in the learning center, to all of the unicycle performances and workshops. There were plenty of prizes passed out to the lucky winners at the annual raffle. A full day of fun and entertainment was witnessed by all who attended and participated. Day four of the festival was hampered by a morning down pour of rain that significantly reduced attendance to the festival and to Gorvernors Island on a whole. But that did not stop the the festival from carrying on. Mother Nature was kind so, by afternoon the dismal weather cleared up and the sun emerged onto the few unicyclists that did show up. Despite not having the crowds of the day before, all who attended managed to have a great time enjoying a day of unicycling on and around the island. If you have never been to one of the the unicycle festival I invite you to come out next year. The unicycle festival is quite expensive to put on every year so donations are more than welcome. 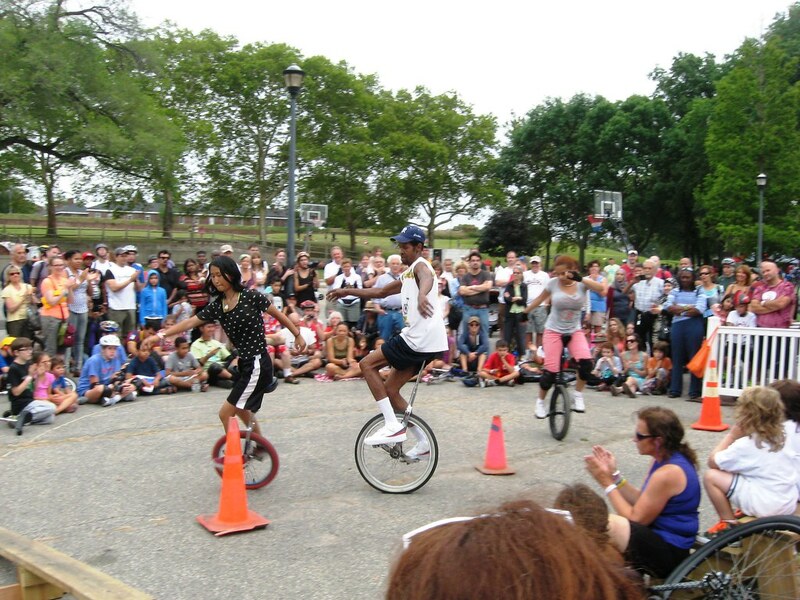 If you would like to support the festival financially or by volunteering, please visit the New York Unicycle Festival website to find out how you can be a part of next years festival. If you have some time, you can always check out past festival photographs as well as the event photo albums from through out the year on the New York Unicycle Club Flickr site. Once again my unicycle friends! It is time for the 2016 New York City Unicycle Festival. This annual event produced by the Bindlestiff Family Circus promises to be bigger and more popular than the previous years. This year it will continue with second year of expanded unicycle activities to four days. It will be held from Thursday September 1st – Sunday September 4. Organizers have a goal of breaking the previous attendance records from past unicycle festivals. 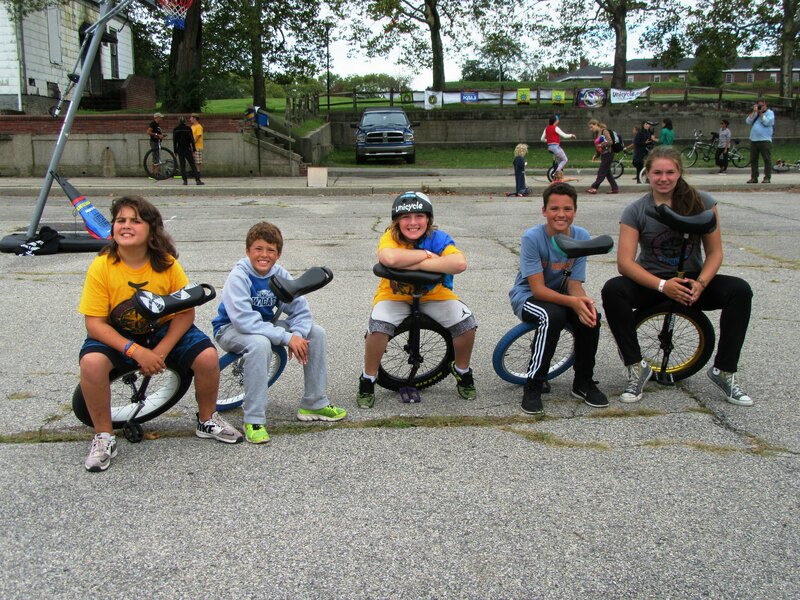 So grab a friend and come on out to all four days of unicycle activities. Day One: Round trip ride Battery Park to Central Park. This year will be the second annual Thursday big wheel ride for day one. 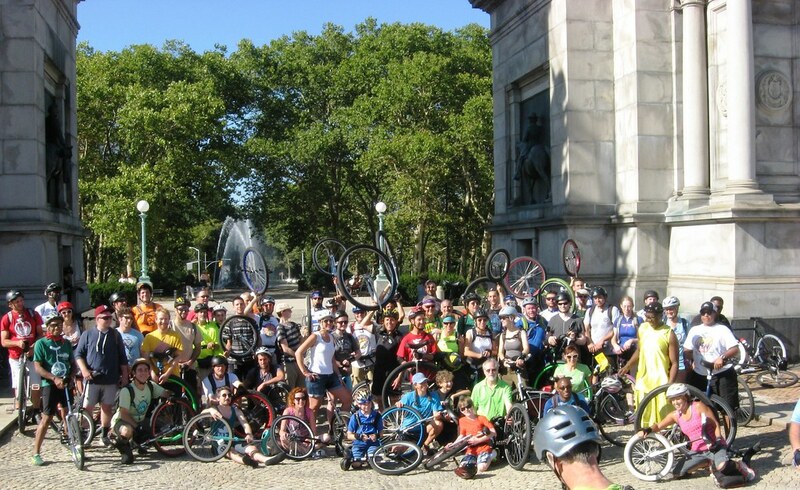 At 10:00 am participating unicyclist will bring their unicycle having 26″ or larger wheel to Battery Park. From Battery Park we will ride up the west side bike path and over to and around Central Park. We will travel down to the south west end of the park at Columbus Circle for a lunch break. But, the ride will not necessarily end there. Part two of the ride will return back down the bike path to Battery park. The round trip total is about 16.5 miles. Day Two: Brooklyn Bridge and Coney Island ride. The annual celebration of Brooklyn Unicycle day occurs on Friday. The celebration will commence with a 3:00 pm unicycle ride across the Brooklyn Bridge. Many of the unicyclist will continue riding on a 13 mile tour through Brooklyn organized by the Unicycle Bridge Tour group. The tour will make rest stop visits to Grand Army Plaza and Prospect Park South. then onto to our final destination of Coney Island via the Ocean Avenue bike path with one last rest stop at around Avenue N. Activities at Coney Island will be announced soon. All are welcome to join us at Coney Island no unicycle is required. So, if you like to participate at Coney Island amusement park activities just meet us at Nathans Famous at around 5:45 pm. Altogether there will be at minimum of about 13 miles of unicycle fun. All wheel sizes are welcome to participate in the ride across the bridge. However, a 24 inch or larger wheel would be highly recommended for the ride onto Coney Island. Quite a few unicyclists have completed the ride on a 20 inch sized wheel. One rider has even completed the ride on a 20 inch giraffe unicycle. For those that do not want to ride unicycle all the way to Coney Island can take the subway and meet us there. Days Three and Four: Governors Island. Moving forward to main festivities on Saturday and Sunday. You need only to hop on the $1 ferry over to Governors Island from either the Brooklyn or Manhattan ferry terminals to arrive between 11:00 am to 5 pm. 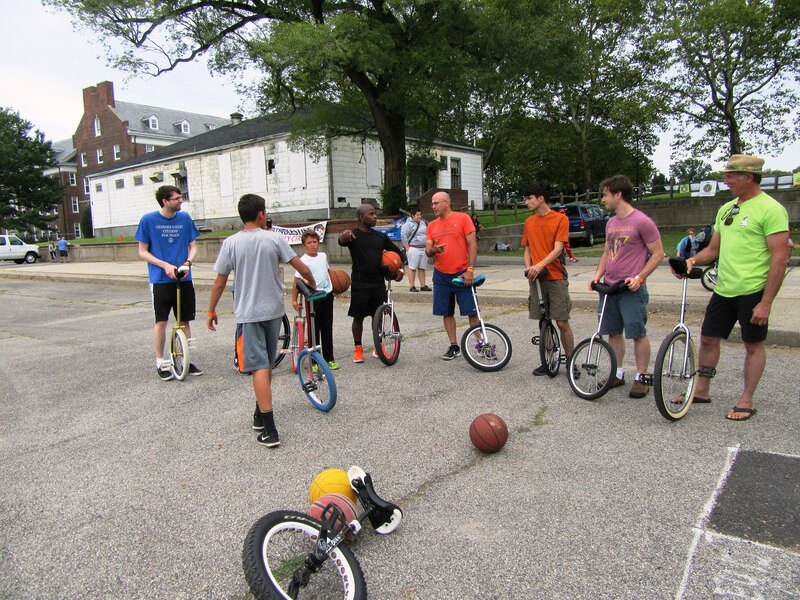 Two consecutive afternoons of unicycle activities including races, unicycle sport competitions in basketball and hocky, unicycling and juggling shows and Beginner and advance skills unicycling learning workshops. There will be raffles on both days and vendors maybe available. If you plan on coming for both days, hold onto to your ferry ticket for the second days journey. Though you can bring your own food, there are variety of food trucks and food vendors available on the island. Come on out and join the fun. Please Contribute! As it is quite expensive to present these free activities I encourage every one to help support with donation of whatever financial support you can afford. While purchasing Tee shirts and raffle tickets is helpful a direct tax deductible donation to the cause goes a whole lot further. Potential sponsors are invited to visit the event website sponsor page for information on how to become an event sponsor. The activities schedule with few exceptions will mirror previous years festival so I will refer you to the event’s website for further details To reach Governor Island there are ferries leaving from Brooklyn and lower Manhattan check out the ferry schedules and plan accordingly. Helpful event links: Additional detailed information can be found at the following websites. NYC 2016 Unicycle Festival website for event details and Coney Island ride route map. You can follow some of the latest event developments on the Festival’s Facebook page. You are encouraged to invite your facebook friends via the Brooklyn Unicycle Day Facebook event page. The Trust for Governors Island website for island information including ferry service schedules from Manhattan and Brooklyn. National Park Service Governors Island web page for additional information about island events and directions. Governors Island Map. That’s right unicycle enthusiasts! It is time for the 2015 New York City Unicycle Festival. This annual event produced by the Bindlestiff Family Circus keeps getting bigger and more popular each year. This year it has been expanded to four days. It will be held from Thursday September 3rd – Sunday September 6. Organizers of this festival aim to out do previous attendance records from past unicycle festivals. New this year is Thursday's big wheel ride. 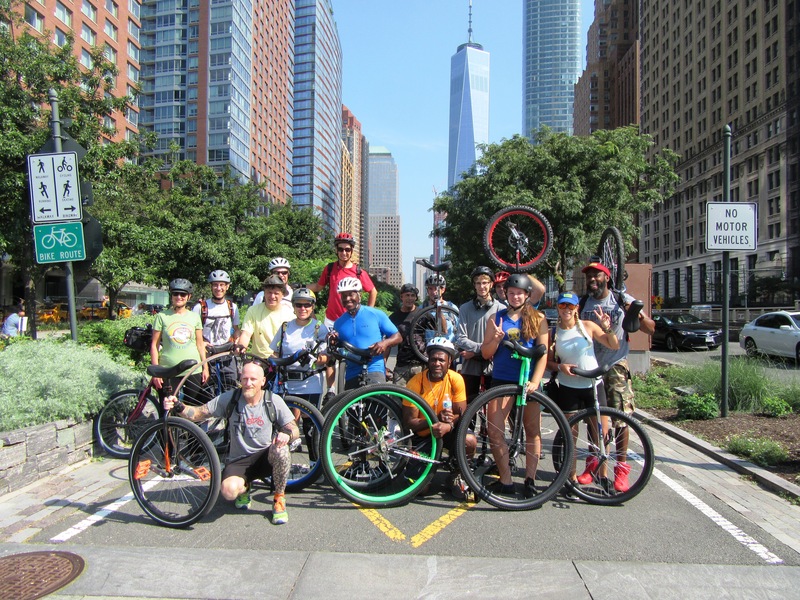 On Day one at 10:00am unicyclist who would like to participate with unicycle having 26" or larger wheel will meet up at Battery Park. From Battery Park we will ride up the west side bike path and over to and around Central Park. But, the ride will not necessarily end there. Part two of the ride will continue over to the east side of Manhattan and ride back down to Battery park. Part two of the ride will take place mostly on the streets so if you are not comfortable riding in traffic you can opt out and take the subway back down to Battery park. 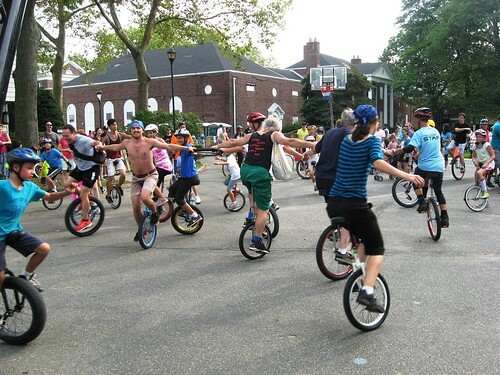 Day two of this year's festival will be the annual celebration of Brooklyn Unicycle day. The celebration will commence with a unicycle ride across the Brooklyn Bridge. Many of the unicyclist will continue riding on a 13 mile tour through Brooklyn organized by the Unicycle Bridge Tour group. The tour will m make visits to Grand Army Plaza and Prospect Park then onto to our final destination of Coney Island via the Ocean Avenue bike path. Activities at Coney Island will be announced soon. All are welcome to join us at Coney Island for activities there. No unicycle is required to participate at Coney Island amusement park. Altogether there will be at minimum of about 13 miles of unicycle fun. All wheel sizes are welcome to participate in the ride across the bridge. However, a 24 inch or larger wheel would be highly recommended for the ride onto Coney Island. Quite a few unicyclists have completed the ride on a 20 inch sized wheel. One rider has even completed the ride on a 20 inch giraffe unicycle. For those that do not want to ride unicycle all the way to Coney Island can take the subway and meet us there. Moving forward to main festivities on Saturday and Sunday. You need only to hop on the $1 ferry over to Governors Island from either the Brooklyn or Manhattan ferry terminals to arrive between Noon to 5pm. Two consecutive afternoons of unicycle activities including races, unicycle sport competitions, unicycling and juggling shows and Beginner and advance skills unicycling learning workshops. There will be raffles on both days and vendors available including Unicycle.com. Come on out and join the fun. As it is quite expensive to present these free activities I encourage every one to help support with donation of whatever financial support you can afford. While purchasing Tee shirts and raffle tickets is helpful a direct tax deductible donation to the cause goes a whole lot further. The activities schedule with few exceptions will mirror previous years festival so I will refer you to the event’s website for further details To reach Governor Island there are ferries leaving from Brooklyn and lower Manhattan check out the ferry schedules and plan accordingly. Helpful event links: Additional detailed information can be found at the following websites. 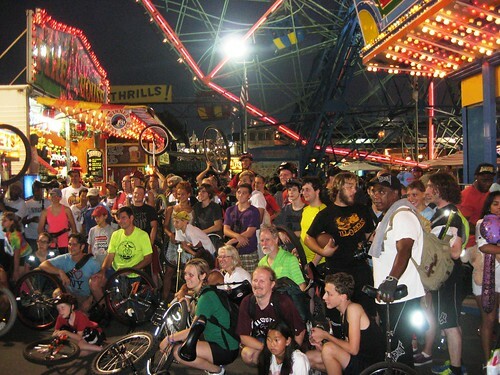 NYC 2015 Unicycle Festival website for event details and Coney Island ride route map. You can follow some of the latest event developments on the Festival’s Facebook page. You are encouraged to invite your facebook friends via the Brooklyn Unicycle Day Facebook event page. The Trust for Governors Island website for island information including ferry service schedules from Manhattan and Brooklyn. National Park Service Governors Island web page for additional information about island events and directions. Governors Island Map. The 2014 New York City Unicycle Festival organized by the Bindlestff Family Cirkus, began on August 29th with the celebration of Brooklyn Unicycle Day. This has been the fifth annual three day unicycle festival that has taken place in New York City. At just before 3:00pm, 66 unicycle riders gathered at the City Hall park just across from the entrance to the Brooklyn Bridge walk way awaiting the signal to head over the bridge into Brooklyn. After making it to the Brooklyn side of the bridge, 46 unicycle riders decided to continue on riding through Brooklyn with Coney Island being the final destination. The tour across the bridge and through Brooklyn was organized by Unicycle Bridge Tour. It was an incredible day weather wise with warm temperatures with low humidity and a gentle breeze. Upon reaching Coney Island riders were greeted and joined by a host of additional participants ready to continue with the day's festivities at Coney Island. We gathered at Nathan's Famous on Surf Avenue to fuel up for the evening. Some took advantage of the free ride on the Wonder Wheel after posing for the group photo below. A little later that evening an incredible array of talented performers put on a show for large crowed that gathered at the Shooting Gallery Art Annex. The performers, performed nine separate acts in front of a packed house. Everyone was wowed and entertained by the dancing, riding, acrobatics, balancing, juggling and magic acts that the group performed. 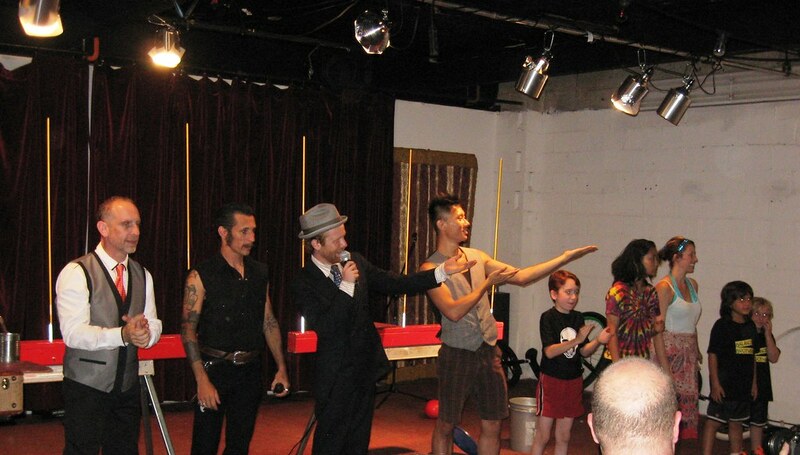 The show was hosted by Kyle Petersen also known as "The Brooklyn Juggler". Days two and three of the festival took place on Governors Island. Day two being the main day of the festival, was chock full of activities with DJ Sky King mixing on the ones and twos providing music in the background for both days. Available activities included: unicycle basketball, unicycle hockey, a trials course, unicycle sumo, unicycle skills performances and a whole lot more. Staff from Just One Wheel were on hand to help teach both kids and adults how learn to ride in addition to the well attended learning center. Unicycle.com brought their trailer full of unicycles, unicycle part and accessories for purchase. After the performances, a raffle was held where lucky ticket holders won unicycle parts and unicycle accessories. The grand prize was a brand new trials unicycle courtesy of Unicycle.com. A great time was had by all who attended. Many expressed their appreciation for the festival and all of the activities that took place. The photos above are just a small sample of the photos taken over the three days of the festival. I hope that you take the time to view all of the photos on our Flickr site. The photo may provide a better sense of the activities that took place. I would have liked to have taken many more photos however, there was just so much to do at the festival. In any event, while you are there on the site, you can see and enjoy all of our photo albums. Additional photos are posted each month. This year's festival, as has the previous festivals are provided at a great cost. As such the Bindlestiff Family Cirkus is continuously looking for additional funding and sponsors. If you, someone you know or, some local company r vendor would like to participate or contribute to next year's festival, do not hesitate contacting them via their website. Any assistance to having this event continue annually will certainly be appreciated. Yes people, it is again that time of the year in New York. That’s right! It is time for the 2014 New York City Unicycle Festival. This annual event produced by the Bindlestiff Family Circus keeps getting bigger and more popular each year. This year it will be held from Friday August 29 – Sunday August 31. Organizers of this festival aim to out do previous attendance records from past unicycle festivals. As in past years the festival will kick start with the celebration of Brooklyn Unicycle day. The celebration begins with a unicycle ride across the Brooklyn Bridge. Many of the unicyclist will continue riding on a tour through Brooklyn organized by the Unicycle Bridge Tour group. The tour will m make visits to Grand Army Plaza and Prospect Park then onto to our final destination of Coney Island via the Ocean Avenue bike path. Activities at Coney Island will be announced soon. All are welcome to join us at Coney Island for activities there. No unicycle is required to participate at Coney Island amusement park. Altogether there will be at minimum of about 13 miles of unicycle fun. All wheel sizes are welcome to participate in the ride across the bridge. However, a 24 inch or larger wheel would be highly recommended for the ride onto Coney Island. Quite a few unicyclists have completed the ride on a 20 inch sized wheel. One rider has even completed the ride on a 20 inch giraffe unicycle. Moving forward to main festivities on Saturday and Sunday. You need only to hop on the free ferry over to Governors Island from either the Brooklyn or Manhattan ferry terminals to arrive between Noon to 5pm. Two consecutive afternoons of unicycle activities including races, unicycle sport competitions, unicycling and juggling shows and Beginner and advance skills unicycling learning workshops. There will be raffles on both days and vendors available including Unicycle.com. Come on out and join the fun. As it is quite expensive to present these free activities I encourage every one to help support with what ever financial support you can afford. While purchasing Tee shirts and raffle tickets is helpful a direct tax deductible donation to the cause goes a whole lot further. The activities schedule with few exceptions will mirror previous years festival so I will refer you to the event’s website for further details To reach Governor Island there are ferries leaving from Brooklyn and lower Manhattan check out the ferry schedules and plan accordingly. Helpful event links: Additional detailed information can be found at the following websites. NYC 2014 Unicycle Festival website for event details and Coney Island ride route map. You can follow some of the latest event developments on the Festival’s Facebook page. You are encouraged to invite your facebook friends via the Brooklyn Unicycle Day Facebook event page. The Trust for Governors Island website for island information including ferry service schedules from Manhattan and Brooklyn. National Park Service Governors Island web page for additional information about island events and directions. Governors Island Map. The 2013 New York City Unicycle festival made some local news stories. Epoch Times Snaps section posted a nice selection of photographs from the festival. I cannot link directly to the photograph selections so please follow the link above. It is worth the click. 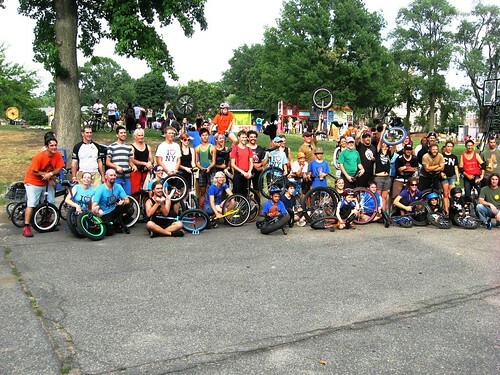 Next up is the Brooklyn Paper where Will Bredderman posted an article about the fourth annual celebration of Brooklyn Unicycle day and the Unicycle Festival.Click the link or the photo to get to the article. Next up we have the Sheepshead Bites where Willie Simpson posted and article with several photos of the unicycle ride through Brooklyn to Coney Island. Finally Ali Wolf reporting for Brooklyn News 12 who posted a video of the kick off of unicycle festival beginning with the initial group of participants crossing the Brooklyn Bridge in celebration of Brooklyn Unicycle day. Click the link to go the page with the video. Of course there is nothing like being at the the unicycle festival but if you could not make it the articles and our own reporting will give you a taste of what it is like. Perhaps you will come out next year. The 2013 New York City Unicycle Festival was as fantastic a festival as years past. 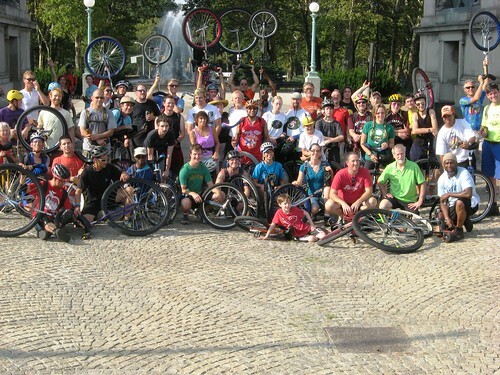 We had 69 unicyclist cross over the Brooklyn Bridge in celebration of Brooklyn Unicycle Day. Once across the group you see pictured above continued riding to the first stop at Grand Army Plazza. The ride did not end there. We continued to ride through Prospect Park and onto Coney Island. Check all the photos that I took throughout the day and evening in the Brooklyn Unicycle day Album. At Coney Island we were joined by even more unicyclists, friends, family and jugglers who enjoyed a ride on the Wonder Wheel, a unicycle and juggling entertainment show and topped off by the Friday night fireworks show. But the fun did not end there we still had two more days of unicycle fun on Governors Island. Saturday on Governors Island we had a host of unicycle activities that was just so much fun. We had a tremendous turn out. We had a unicycle show and the Hell on Wheel trials course. As always the learning center was busy throughout. Check out the photos that I took in the Saturday Unicycle Festival Album. 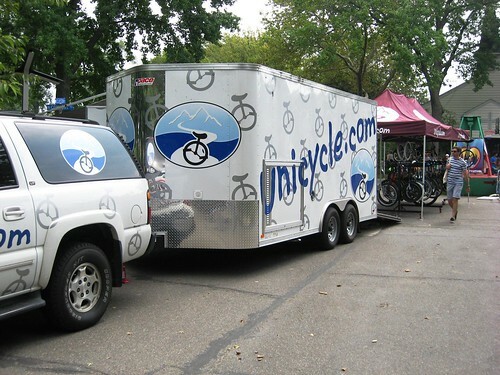 Unicycle.com brought out their mobile unicycle trailer store. All types and levels of unicycles and unicycle parts were available for purchase. On Sunday we capped it off with even more activities including unicycle sumo wrestling, unicycle football demo and an unicycle pinata. Overall a good time was had by all and it would be hard to compare which of the four unicycle festivals were the best. I was so busy doing and seeing and conversing I did not get around to taking any where near the amount of photos for those of you that could not make it. However, take the time to also check out the photos I did take in the Sunday Unicycle Festival Album. I hope this gives you a taste of what goes at the three day Unicycle festival and I hope that many more of you can make out next year.